Utilities are increasingly looking to offer energy efficiency programs to meet regulatory obligations, reduce peak demand, and contribute to environmental protection. Voluntary partnerships are an important pathway for meeting these goals because energy efficiency delivers an impressive value proposition to both consumers and businesses. ENERGY STAR, the government-backed symbol for energy efficiency recognized by more than 89% of American households, provides a powerful platform for utilities implementing demand side management programs. Many utilities have prescriptive rebate programs that offer incentives for high efficient HVAC equipment. But nearly half of all heating and cooling equipment in U.S. homes never performs to its advertised capacity and efficiency due to poor design and incorrect installation. This means homeowners pay higher operating costs over the life of the equipment and utilities may not be realizing their deemed energy savings they had anticipated. Technical and training resources for participating contractors. 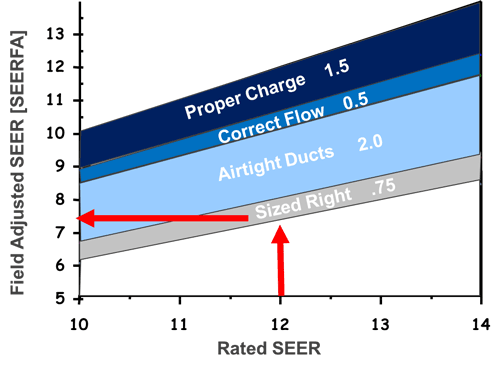 Figure 1 illustrates the potential losses in efficiency when equipment is not installed correctly. Systems not designed, installed, and verified to meet these quality installation standards may not operate as designed or deliver their rated efficiencies. A system not designed and installed to meet quality installation standards will not preform to the OEM rated efficiency. The impact of each of these elements varies for each installation and multiple “faults” are additive, but in all cases the end result is a system that under performs. For more information about incorporating the ENERGY STAR Verified HVAC Installation Program into your utility portfolio, download the ESVI Sponsor Guide (822KB) and please contact esvi@energystar.gov. Learn how ESVI can benefit your organization.